What Causes Your MOT to Fail? In an alarming statistic, the pass rate of MOTs yearly in the UK has fallen as low as 50%, depending on your region. With such a high amount of failures- ballooning over 300,000 p/a in Birmingham- we’ve come together to analyse why so many of cars are failing, particularly when so many of them fail due to one or two oversights that could easily be rectified. MOTs are scary. Dreaded and stressful, waiting for your MOT results every year is a trying time, filled with anxiety that you might be about to be hit with a large fee that could set you back significantly and possibly wipe out a wonderful holiday you’ve been planning for months or a very special present you were about to buy for a loved one. So. What checks can you perform to spot these MOT failures early? ... are the part with the highest percentage of failures, a strange statistic considering they are also the ones most easily and cheaply repaired. Have a friend or family member circle your car as you test each light: headlamps, hazards, indicators and tailgates in succession. If you find one not working, scout online or grab a quote through us, as replacement bulbs for indicator/hazard lights begin as low as £5, with headlight lamps ranging from £25 upwards. You might find fees at your local garage will be significantly higher, particularly when you factor in hourly labour rates. This is a recurring theme throughout this article, and it helps to know you’re getting the best possible value for your money. ... with its complex matrix of springs, shock absorbers, struts and coils is a very in-depth system which should only be repaired by a professional. Rather than there being one outright test for a failing suspension, it should start to become obvious in the quality of your ride. Rough rides, including your vehicle ‘bouncing’ on every bump, drifting, lurches or nose dipping when you apply the brakes, or an uneven tread wear on your tyres (a sign the suspension isn’t propping the car evenly) are all strong indicators your suspension is failing. This next point we can’t stress enough: suspension repair can be very expensive. Depending on what parts in your suspension are faulty, suspension repair can approach a solid £1000, if the whole system is shot. Equally, it could be as small a job as a wheel alignment, or the replacement of one or two shock absorbers, which begin at around £50 a piece. It’s imperative you get multiple quotes from reputable garages when it comes to suspension repair. It’s one of the easiest and most costly ways customers are ripped off. If you know your local garage to be trustworthy then excellent. Otherwise, consider grabbing a quote from us. We only network verified garages from independent quality assurers and previous customers. ... are the most important part of car safety. So important so we devoted an entire article to diagnosing if they need repairing. Because of their importance, law dictates brakes receive an entire section of an MOT to themselves, which undoubtedly leads to their 10% fail rate. We recommend having a browse of this article and stress you can never overestimate the health of your brakes. Brakes are important but also one of the cheaper core parts to replace. When you weigh those costs against the safety of you and your family, they become strikingly small. Please don’t take a chance with your brakes. Treat them early, save your costs and save your health. ... are another potentially expensive replacement that can be prevented by good practice and consistent attention. As detailed in our specialised piece, a single tyre in the UK can set you back anything between £35 and £150 a pop, a price which only spirals further out of control the more tyres that fail your MOT. With such large fees, tyre care is an investment worthy of us all, with good practice potentially adding years and tens of thousands of miles to your tyres and avoiding those harsh fees. One quick test you can perform in no more than a minute right now, is the 20p test, which verifies your tyres’ treads and how deep their grooves are. If you insert a 20p coin into the grooves, the outer rim will either be visible, or disappear entirely. If it disappears your tyres treads are over the legal minimum of 1.6mm and are fine. If you can see it, they no longer are and will likely fail their MOT. If you catch this early, there’s a chance it can be fixed, or at least you’ll avoid a high MOT repair fee. Too late, and they’ll legally need replacing. ... is usually fairly obvious and can legally be no greater than 10mm across in the driver’s view. If you’ve suffered damage, a good deal of car insurance policies now offer replacement windshields free, although will need to assess the damage to see if you’re covered. If not, it will still be much cheaper to get it fixed prior to your MOT alone, as you’ll avoid the premium that comes with the repair. One other thing to check is your windscreen wipers. The front wipers are checked in the MOT and they need to adequately clear the viewing space out of the screen. If yours are leaving blind spots in their sweep, they’ll fail your windscreen at MOT. A new pair of wipers can go for under a tenner online. ... will often shout at you if it’s damaged! Start your engine and let it warm to regular temperature in an open space. Then, simply listen. If you hear any splutters, coughs, chokes or unusual noises, it’s a sign your exhaust is leaking internally and needs repair/replacing. Another tell-tale sign is smoke. Exhausts should smoke at a regular and steady pace. If you notice any excess or unusually dark emissions, take it in to be checked. A new exhaust, depending on the extent of the damage may only be a small repair and will cost around £50 to upwards of £100 if the damage is extensive. Don’t forget to grab a quote from us if you feel you’ve been strapped with a fee that is abnormally high. They must be legible- from 20 meters away. Essentially, ensure your plates are intact and clean. Replacement plates can be bought and fitted by you, or will be done in garage for as cheap as £8. These should be kept high consistently anyway but it helps to do a double-check before your MOT, in-case they’re lower than you thought and you’re strapped with that pesky fee! 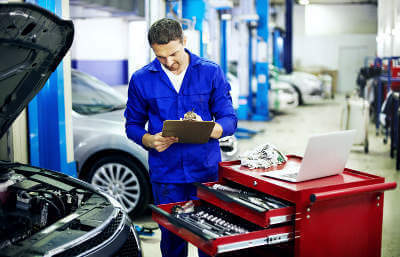 There’s a steadfast rule when it comes to car maintenance and repair and that’s if you can diagnose and repair damage before your MOT, you’re better off. For one, many replacement parts can be bought cheaper independently than a garage will provide in bulk in your MOT. Yet, even if the parts cannot be bought cheaper, you avoid the potential of a one-off harrowing fee that you cannot afford to pay. MOTs and their subsequent service not only tend to charge replacement parts at a premium, but you have the cost of hourly labour rate of service to factor in also. This can lead to a one-off lump-sum fee which is very high, and set you back considerably. The true best solution to MOT failure is constant care and attention. Read our guides, which are consistently updated and perhaps invest in an intermittent service at the 6-month half-way point between MOTs. The best chance your car has of staying healthy is healthy TLC from you.